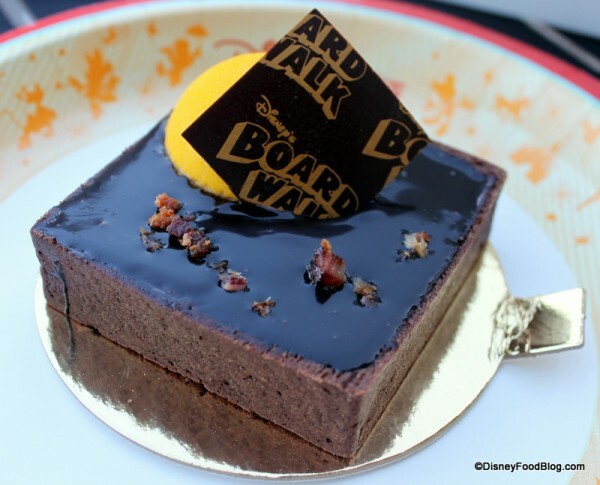 And now…a recipe for a super-interesting new dessert in Disney World! When the brand new BoardWalk Bakery reopened earlier this year, we were there bright and early on the very first morning to bring you a full account of what was new, and what was returning. And while we found many brand new things to love, like the Lemon Meringue Tart (sigh), one of our top pics was the Peanut Butter, Banana, and Candied Bacon Pie! Sounds pretty keen, doesn’t it? Well, it kind of is! The combination of sweet, rich peanut butter filling, bananas, and salty bacon create the perfect decadent dessert. I was more than a little excited when I discovered this recipe for the pie…so now I can make it at home! And the best news of all — it’s pretty easy stuff! 2. Coat bacon on both sides with brown sugar. Place on rack and bake 20 to 30 minutes, or until crispy, depending on thickness of bacon. Remove from oven. Once cooled, dice and set aside. 3. Cream together peanut butter, cream cheese, and sugar until smooth. 4. Whip cream to soft peaks in a separate bowl; gently fold into peanut butter mixture. 5. Fill pie shell halfway with mixture, then evenly top with banana slices. Top slices with remaining mixture. Sprinkle with chopped bacon. Refrigerate until ready to serve. And then, step back and wait for the OOHS! and AHHHS! to commence! Who knew that such yummo food could be so completely simple to make?? 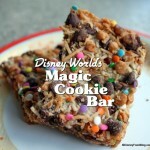 I’ll definitely be making this awesome pie to tide me over until my next Disney trip! Like, I’m grabbing my keys and heading to the grocery store. Now. What about you? Leave us a comment if you plan to try it, too! 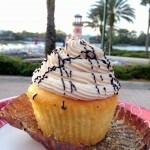 Recipe Courtesy of Disney Parks Blog. « Five Legged Goat Krispy Treat (!!!) 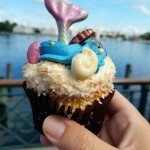 and other Festive Snacks make Holiday Debut at the Contemporary! 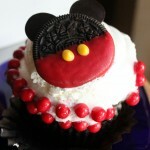 I am so making this for Thanksgiving! Thanks for sharing the recipe! Picture looks like it has some sort of chocolate glaze or sauce on top? Not in the recipe … haven’t been there to try it … anyone know what is on top? Oh my! Yes! Thank you! That’s all I can say. Thanks for the recipe! I was wondering where the chocolate syrup layer goes in the recipe, though. 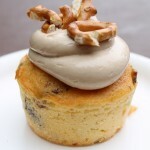 From the pictures, it looks as though there is a layer of chocolate that goes on top the banana/peanut butter/cream cheese mixture, but the recipe says to just top with bacon pieces. Is there a part missing? Thanks again! Tonya and Dawn — The original recipe did not include the chocolate glaze on top — I know, I miss it, too! I’m thinking it was a measure to simplify. 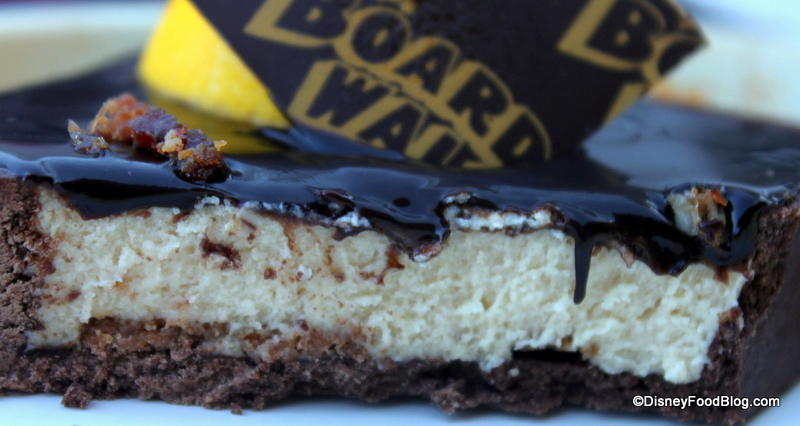 You could top with a glossy ganache. That’s probably what I’ll do when I make it! If you’re looking for a good recipe, check out the one we link to in this recipe for Zebra Domes (at the very bottom.) Good luck! Let us know how it turns out!! i agree, i was looking for a dessert to take to the family for thanksgiving. I think i’ll do this one. This does look interesting, and my friends and I love a seafood restaurant at the seashore that has a wonderful chocolate PB pie, so I guess I’ll be doing some experimental baking soon.